Discs are segment of connective tissue that separate the vertebrae of the spine, providing absorption from shock and allowing for the smooth flexing of the neck and back without the vertebral bones rubbing against each other. A bulging disc is one that has extended outward beyond its normal boundary, due to various forms of degeneration. Should the disc impinge on the ligaments connecting the vertebrae or on nerves of the spine, pain results, though the affliction can also be painless in many cases. The spine is made up of bones known as vertebrae, separated by fibrocartilaginous intervertebral discs. There is only slight movement between any two successive vertebrae, but there is considerable movement throughout the spinal column as a whole. The intervertebral discs are composed of a thick ring of fibrous cartilage, known as the annulus fibrosis which surrounds a jelly-like material known as the nucleus pulposus, and provide flexibility, cushioning, and protection to the spine. The spinal canal runs through the center of the vertebrae and discs and contains the spinal cord running from the brain stem to the first or second lumbar vertebrae. A bulging disc may result when the nucleus pulposus pushes outward. Age-related wear and degeneration. Stretching of ligaments connecting vertebra. Successive strain from improper weight training. Back pain radiating to the legs (lumbar discs). Back pain radiating to the shoulders (cervical discs). Asymptomatic, only appearing on a magnetic resonance imaging (MRI) scan. Bulging discs often occur as a natural consequence of the ageing process, though in some cases, they are a precursor to herniation or rupture of the disc, with the leakage of the disc’s gel-like center. 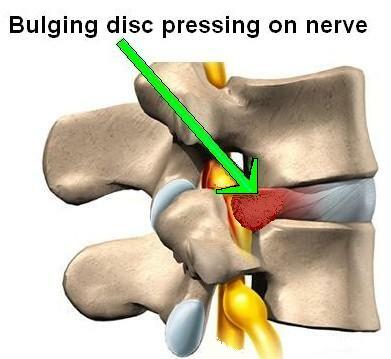 Bulging discs are an example of contained injury while herniated discs are considered uncontained injury. Minimising undue stress on the back may help avoid this injury. More severely bulging discs may in time rupture, causing the inner material to extrude into the spinal canal. In less severe cases, rest and ice are generally sufficient to restore pain-free mobility to the athlete. Call (+65) 64712 674 (24 Hour) to fix an appointment to treat Bulging Disc today.